The Battle of Dnieper was another defeat for the Wehrmacht that required it to restabilize the front further West. The Red Army, which Hitler hoped to contain at the Dnieper, forced the Wehrmacht's defenses. 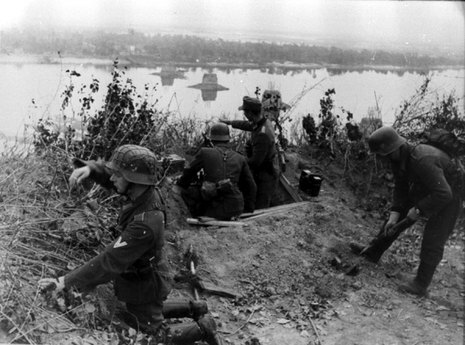 Kiev was recaptured and German troops lacked forces to annihilate Soviet troops on Lower Dnieper bridgeheads. The right shore was still in German possession for most part, but both sides knew that it would not last for long. Additionally, the Battle of Dnieper demonstrated the strength of the Soviet partisan movement. The "rail war" operation staged during September and October 1943 struck German logistics very hard, creating heavy supply issues. Incidentally, between 28 November and 1 December 1943 the Teheran conference was held between Winston Churchill, Franklin Delano Roosevelt, and Stalin. The Battle of Dnieper, along with other major offensives staged in 1943, certainly allowed Stalin a dominant position for negotiating with his Allies. Soviet troops began to pour across the Dnieper and soon liberated the Ukrainian capital of Kiev. Soon elements of the Red Army were nearing the 1939 Soviet-Polish border. In January 1944, the Soviets launched a major winter offensive in the north which relieved the siege of Leningrad, while Red Army forces in the south cleared the western Ukraine.